Save 25% Off Selected Cashmere & Merino Styles!! Save 25% Off Selected Cashmere & Merino Styles. Use coupon code: BONFIRE3 at checkout. Shop Now. Get 25% Off Selected Cashmere & Merino Styles. Get 25% Off Selected Cashmere & Merino Styles. Enter coupon code: FIREWORK at checkout. Shop Now. Free Shipping For All Orders Over $150! Free Shipping For All Orders Over $150! Shop Now. No Coupon Needed. Our Biggest Knitwear Clearance Sale Ever - Save 50% OFF! Our Biggest Knitwear Clearance Sale Ever - Save 50% OFF! Shop Now. No Code Needed. 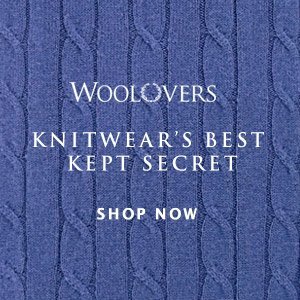 Wool Overs is a family run British company specializing in selling high quality beautiful knitwear. We�ve been famous for our range using natural materials - wool, cashmere, silk and cotton blending these materials together has made us unique in the market. Our knitwear�s excellent value for money has made us a success story and one of the fastest growing companies in UK. Our success continues overseas as we�re sending our beautiful knitwear to almost every corner of the globe. Currently operating 8 sites with 7 international all having payment options in many currencies the sites are based in UK, USA, Canada, Australia, New Zealand, France, Germany and Russian with Spanish site to be launched next and the French, German and Russian sites in local language.